This nice community swimming hall is practically empty during the summer, but offers a 25-meter pool, jumping tower, and good saunas. The saunas are exactly the right temperature, which is a bit surprising for a community saunas and maybe also more generally many saunas in Sweden. But the sauna was decently hot but not too hot. Very nice! 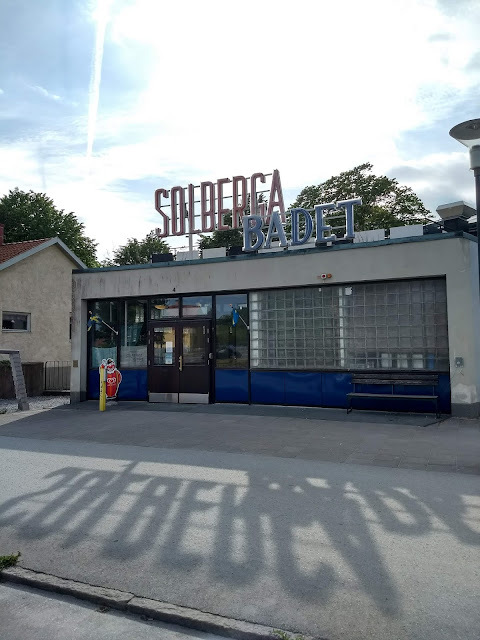 I visited Solbergabadet a couple of times during the week, on almost all days. On one day though I had shower in the camp, using my shower bag that was hanging from a tree, warmed up water during the day. That was nice, too. It was also fun to watch Ralf (who came with me one day) to swim backwards for cave diving practice. I need to try backwards swimming next time. Photos (c) 2018 by Jari Arkko and Gotland.se. All rights reserved. More sauna-related articles can be found at the https://saunablogger.cool website, and stories about swimming at the https://planetswimmer.com/ website.